An utlra-slim tungsten barrel features a variety of grip points to suit every player. Satin uni-directional knurling for easy release and accuracy... high polish for the finishing touch. Available in 16 & 18 gram weights with 2BA points. 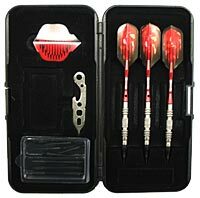 Presented in a deluxe case with extra flights, shafts, 2BA tips and a dart mechanic tool.